On paper the HT-C6930 is an impressive box of tricks, but is it over-specified? It boasts Blu-ray (including 3D), 7.1 speakers, internet video, multimedia playback and home networking amongst its numerous credentials. Feature overkill or not, the system certainly has panache. The main unit is crafted from high-grade black, gloss plastic, sporting a backlit 3D logo and an illuminated disc tray. With their sturdy cabinets and components, the speakers have a superior, almost dedicated audio brand-like quality to them. 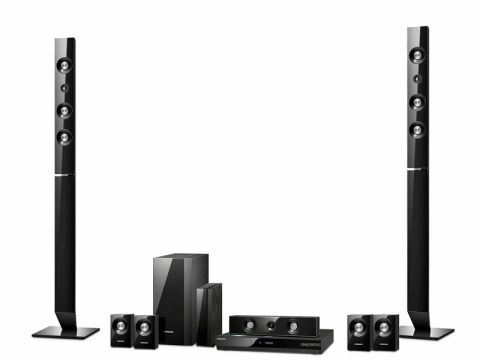 The front left and rights can be wall or stand-mounted, in tall-boy fashion, while the wireless kit lets you place the surround back speakers behind the listening position. The two other surround speakers, however, are hard-wired so any thoughts of a cable-free paradise are short lived. Connections are light but effective, with built-in Wi-Fi and dual HDMI inputs, which is good news for routing kit such as a games console or digibox to a TV. Aided by colour-coded speaker terminals and a granny-proof set-up wizard, installation is straightforward. Sound setup is easy, too: using the supplied microphone and a hideous orchestral cacophony emitted by the speakers, the system's auto calibrator detects cabinet distances and sets its levels and frequencies accordingly. As a network media device the HT-C6930 works nicely, and the methodical instructions manual does an excellent job of taking the pain out of configuring a network. As per the whole system, the interface is a pleasure to use. This system serves up some fantastic images, especially with 2D sources such as Avatar on Blu-ray. The HT-C6930 is a master of the three Cs – clarity, colour and contrast. Detail levels are quite stunning; every fibre of Sully's T-shirt and bristle of his beard are clearly visible on a Samsung UE46C8000 3D screen. With the HT-C6930 as the source, the screen of a same-brand 3D TV can automatically switch to its full HD 3D display mode. A message then prompts you to don the 3D goggles and switch them on. This is certainly no slouch as a 3D deck, retaining clarity and brightness with the Monsters Vs Aliens movie. Crosstalk is an issue, but how much so depends largely on which screen you're using.